Back in June of this year, I took off on a bike tour from Amsterdam to Spain and back, I will tell that story later in another article. This story here is all about my visit to the Wielermuseum Roeselare – at the time when I was planning my trip to Spain – I had not heard about the Wielermuseum Roeselare. Fate took a turn – April 28th – I read an article in the Guardian named – Cycling is religion in Flanders, Belgium in which the Wielermuseum Roeselare was mention. I looked at the pictures in the Guardian Article and decide I need to go there to see it for myself. I worked a visit to the Wielermuseum Roeselare in Belgium into my bike tour schedule. I took off from Amsterdam and got to Roeselare on a Friday afternoon, on my way to the museum in Roeselare, I passed by a bar with a few guys standing outside smoking, when one of them spotted me he called out Tom Boonen and a big cheer came from the rest of the guys. Cycling is definitely a religion in the Flanders of Belgium. The Wielermuseum Roeselare is housed in a former church, just outside the entrance is this plaque that reads Cycling is Religion – in several languages. The entrance feels like it wants to draw you inside, it tells you to come and see what’s inside. 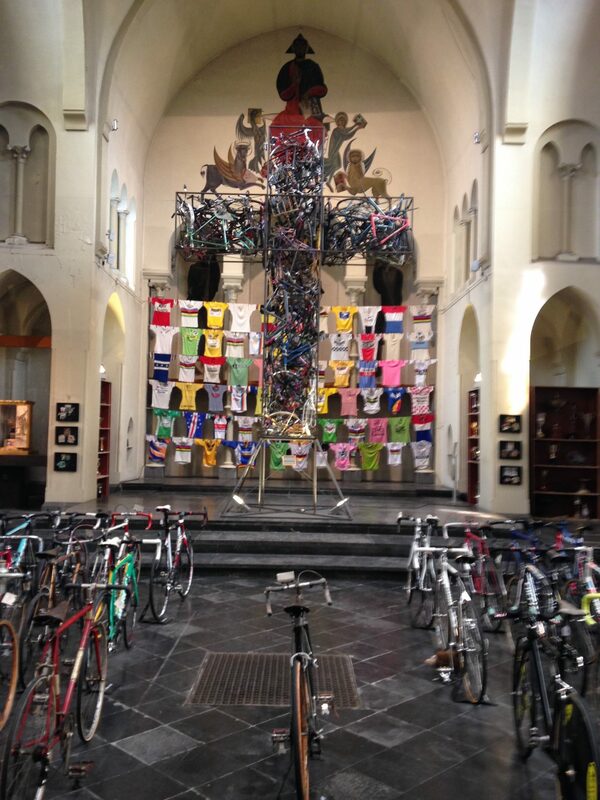 The centerpiece is the altar with a huge iron cross welded together from old bike components – the Croix de Fer, representing the cross at the Col de la Croix de Fer in the Alps, featured in the Tour de France 16 times. Behind the cross is cycling jerseys worn by the icons in cycling, among them Fausto Coppi, Laurent Fignon. The Lance Armstrong confession booth in the altar for the sinners – the dopers, Lance Armstrong confession booth plays a video of his revelatory interview with Oprah Winfrey. As I could not leave my bags outside on the bike unattended, I was allowed to bring my bike inside. How cool was that my bike is inside the bike museum. I highly recommend a visit to the Wielermuseum Roeselare, it should be a visit that every cyclist should do once in a lifetime.